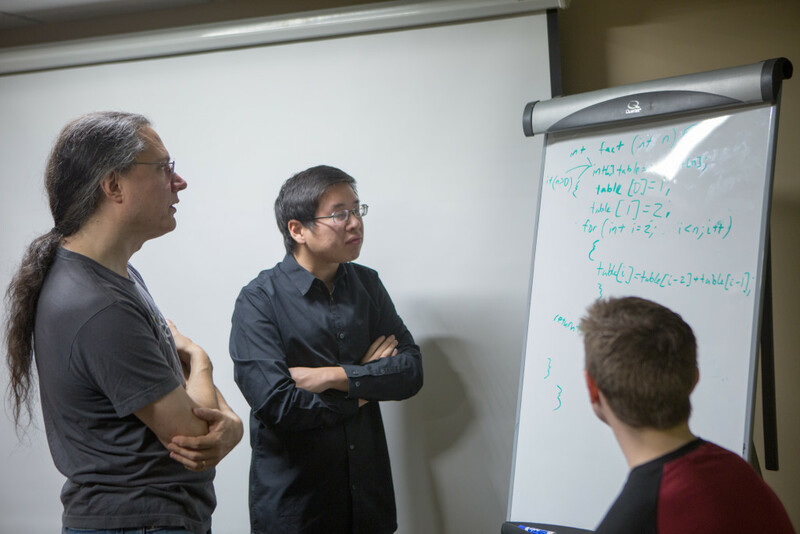 Eric Salo ’88, left, met with computer science students on Dec. 19. Gustavus Adolphus College alumnus Eric Salo ’88 took time out of his holiday vacation to present to current students on Saturday, Dec. 19 about careers in the technology industry. Amidst the hustle and bustle of final exams, students gathered to talk with Salo about opportunities at Google and his path since graduation. “Eric’s presentation was great because it gave students real information from someone who interviews candidates at Google,” Director of Career Development Cynthia Favre said. Salo’s prepared remarks lasted over an hour and included information about the recruiting and interview process at Google as well as his personal experiences working for a variety of technology companies in his 25-year career. Perhaps the most impactful part of Salo’s visit came after the presentation, when he worked through mock interview problems with three computer science students. The group spent an additional hour solving problems, preparing formulas, and writing code on a whiteboard in the career development office. After graduating from Gustavus in 1988, Salo completed his master’s in computer science at Stanford University before taking a job at Silicon Graphics. In 1997 he returned to Minnesota, where he worked for Cray Research before accepting a position at eBureau in St. Cloud. After being laid off in 2014, Salo took the advice of friends in the computer science industry and created a LinkedIn profile. He was contacted by Google less than 24 hours later. A month after their first conversation, Salo was offered a position with the tech giant. “One of the things that attracted me to Google is that they want to make employees happy by letting them work on what they love,” Salo said. Now living back in California, he began at Google as a site reliability engineer before transitioning to work on operating systems using the Linux kernel.